ot many herbaceous plants here in the cold northeast remain green into the month of November. But as the autumn winds blow and the brilliant blue sky reflects the colors below, streaks of vibrant green still punctuate the forest floor in many of our local woodlands. This is due to the surprising evergreen habit of one of our most common native ferns, the Christmas fern: Polystichum acrostichoides. On a recent FLNPS walk to Thatcher’s Pinnacles (in the Danby State Forest) we quickly identified the Christmas fern, Polystichum acrostichoides, standing out against the bright carpet of orange, yellow, red, and brown fallen leaves at our feet. 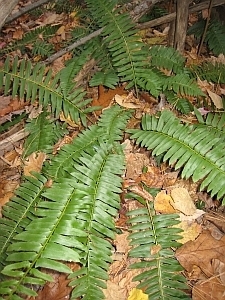 This fern is commonly seen on almost any forest walk in the Finger Lakes Region, and is found in rich, open, and even disturbed woodlands. It is also quite striking in winter, its still-green leaves poking up through the heavy snow. Its distribution is from the fringes of southern Canada, all the way down to northern Florida. It is, however, an eastern species and does not occur very far west of the Mississippi (see map at bottom of this article). Even in summer, P. acrostichoides is one of the more readily identifiable ferns in local forests. The marginal and intermediate wood ferns are two other evergreen ferns growing here, but even these are readily distinguishable from the Christmas fern. The fronds of P. acrostichoides occur in a rosette at the top of an erect underground rhizome. They can be found on shaded, rocky slopes or more often across broad areas of the forest floor. The mature fronds are lanceolate, 30-80 cm in length, and the basal portion of the stipe (stalk of the frond) is covered in small brown scales. The spores are conspicuous, maturing to a golden-brown color and forming a dense mat on the underside of the upper pinnae (leaflets). These fertile pinnae are noticeably smaller than the rest. Perhaps the most prominent feature of P. acrostichoides is the sock-like shape of its pinnae, which are oblong and leathery, 2-6 cm long. This is to say, each pinna has a small projection, or auricle, jutting out from the base, pointed toward the tip of the frond (see photo). The stocking shape of the pinnae may have much to do with the origin of the common name, also these ferns are sometimes used as decorations at Christmas time. Polystichum species are called holly ferns. Polystichum is one of the largest fern genera with 260+ species. Only about 15 of these species occur here in North America with the other members spread across the globe. Over 120 species occur in China and another 100 in Central and South America. 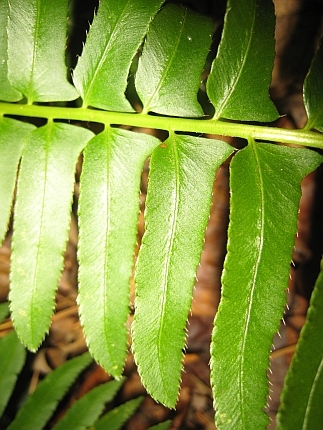 Remarkably, almost all Polystichum have the characteristic sock-shaped pinnae. (Imagine finding one in a foreign country, you’d know the genus instantly!) This genus is part of the largest order of ferns, the Polypodiales, or polypod ferns. 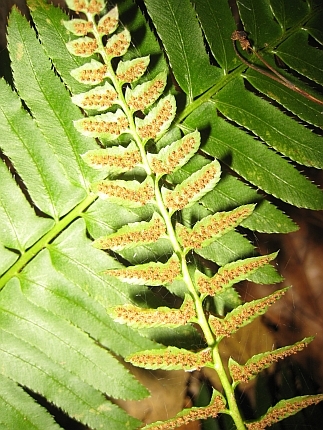 All ferns are united by the fact that they have spores that are produced in little sacs called sporangia. These are often in dense clusters, called sori. The sori are often associated with a structure called an indusium that partially covers them as they develop; protecting them when they are young and tender. They all also exhibit an alternation of generations, in which spores disperse and grow into tiny variously-shaped haploid plants (the gametophyte) before self-fertilizing or cross-fertilizing to form the diploid beautiful green fronds that we see (the sporophyte). The closest relatives of the ferns are the elegant horsetails, and the whisk fern, Psilotum (Psilotaceae). All together ferns and their allies make up the Monilophytes, of which there are more than 12,000 recorded species. Ferns range in habit from the familiar forest herbs to aquatic species to epiphytes happily growing on the branches of tropical trees, to tree ferns that can reach heights of 60 feet. They are ancient plants, in that the first ferns show up in the fossil record in the early Carboniferous period, over 100 million years before dinosaurs walked the earth. Polypod ferns like the Christmas fern, however, are like 80% of today’s ferns in that they evolved from the early ferns during the great fern radiation of the Cretaceous period. This radiation occurred right around the same time that flowering plants also became extremely diverse (see Schneider et. al. 2004). Is this a coincidence? Perhaps. Pteridologists (fern biologists) will likely debate this for years to come. So this month as you stroll through the autumn woods, see if you can pick out this beautiful local polypod, the Christmas fern, as it rapidly becomes one of the last remnants of green on a wintery forest floor. Take note of its characteristic pinnae and you might smile, as I do, picturing relatives of the Christmas fern in the forests of far-off continents, little stockings scattered out across the world. The Angiosperm Phylogeny Website- click on Ferns, s. l.